The first thing Sirisena did was to prorogue parliament from April 12 to May 8, so that tempers cool and issues dividing his Sri Lanka Freedom Party (SLFP) and the UNP are discussed in a calmer atmosphere. The second step he took was to appoint a party committee under senior Cabinet Minister Dr.Sarath Amunugama to discuss with all stakeholders all relevant inter-party issues including the widespread demand in the SLFP to quit the alliance with the UNP and align with the Sri Lanka Podujana Peramuna (SLPP) led by former President Mahinda Rajapaksa. The SLPP under the charismatic Rajapaksa had won the February 10 all-island local bodies elections hands down. And SLPP is but a chip of the old block, the SLFP. It had broken away from the SLFP after Rajapaksa was defeated by Sirisena in the January 8, 2015 Presidential election. Sixteen out of 41 SLFP MPs, including 15 Ministers, had quit on April 11 declaring that they will sit in the opposition benches and oppose the coalition government so long as Ranil Wickremesinghe is Prime Minister. This step was taken after the Joint Opposition’s move to dislodge Wickremesinghe through a No Confidence Motion (NCM) failed despite receiving the support of 16 SLFP MPs. UNP MPs, who also had grievances against the policies and style of functioning of Wickremesinghe, decided to rally round him saying that “outsiders” had no right to tell them who should be their leader. And the UNP, with its allies in the United National Front (UNF), is the single largest group in parliament and as such, its leader has to be Prime Minister by convention. When all the tricks in the book were exhausted, the anti-Wickremesinghe lobby in the SLFP decided to defect and handed in their resignations to the party Chief and President Sirisena. Sirisena had no option but to allow them to go, but on the condition that they support him from outside and not join the Joint Opposition led by his bitter rival Rajapaksa. The rebels agreed to remain in SLFP because if they had formally defected and joined the opposition, they would have lost their seats. However, rebel ex-Minister S.B.Dissanayake, let it be known on April 13, that the rebels intend to work towards unity with the Joint Opposition and the SLPP led by Mahinda Rajapaksa and fight the next elections together. “We will seek a full peoples’ mandate through an alliance with the Joint Opposition,” Dissanayake said. However, President Sirisena hopes that when tempers subside, and when he re-structures his relations with the UNP and its leader, Wickremesinghe in a manner acceptable to the dissidents, at least 11 out of the 16 defectors might come back to his fold. It is with this hope that he appointed a committee under Dr.Amunugama to advice him on re-structuring his relations with the UNP. Fortunately for him, Wickremesinghe is also thinking on the same lines. Committed to the continuation of the National Unity Government till the end of the parliament’s five year term in August 2020, Wickremesinghe had got some of his senior colleagues to discuss resolution of issues with a similar group in the SLFP. He told the media that talks had already started. President Sirisena and Prime Minister Wickremesinghe have been having problems adjusting to each other due to ideological and other political differences. Sirisena and his party ,the SLFP, are Left of Center, nationalistic and wary about the West and India. But the UNP, specially Wickremesinghe, is Right of Center and more accommodative to the demands of the Western powers and India than the SLFP. Used to exercising power to the exclusion of others barring a small group around him, Wickremesinghe often took decisions without consulting the alliance partner SLFP or the President, who chairs the Cabinet and holds ministerial portfolios too. In the last two and half years, the Prime Minister and his party colleagues had taken many economic and political decisions without consulting or taking into account the views of the SLFP or the President. And the President had to reverse many of these decisions. 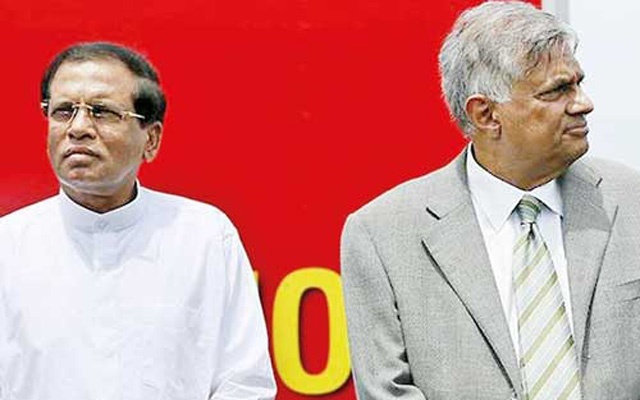 As the economic decisions of the UNP and the Prime Minister could be electorally damaging, the President set up an over-arching committee to advise him on economic matters. He asked the Prime Minister to wind up his cabinet committee on economic affairs. But to the dismay of the President, the Prime Minister did not oblige. Being an Executive President, Sirisena felt that he had the right to determine policies, a claim the Prime Minister and head of the single largest group in parliament, was loathe to accept. The President had also been unhappy with Wickremesinghe’s foreign policy which he felt was more in tune with the interests of the Western powers and India than Sri Lanka. In this area too, he had to reverse some of the decisions of the Prime Minister. It appears that the differences the SLFP and the President have with the coalition partner UNP, have more to do with the leadership of Wickremesinghe and not the UNP as such. Rebel Junior Minister Dilan Perera had said that if only Wickremesinghe had resigned or if the UNP had replaced him ,the SLFP’s alliance with the UNP could have continued and the rebels would not have quit. “The government would have had two thirds majority in parliament to implement its election pledges and passed a new constitution to solve the ethnic issue,” Perera said. “But a foreign power with its local allies had intervened and insisted that Wickremesinghe should remain Prime Minister, thus forcing the hands of the President,” he added. Given the continuation of Wickremesinghe as Prime Minister, chances of the Amunugama committee’s re-structuring inter-party relations to the satisfaction of the rebels, are dim. Meanwhile, the UNP too has said that, while it is interested in continuing the coalition with UNP, it is also ready to form a government of its own. It feels it can get a simple majority by attracting seven to ten from the SLFP to go past the number 113, which is the minimum requirement to form a government in the House of 225 members including the Speaker.